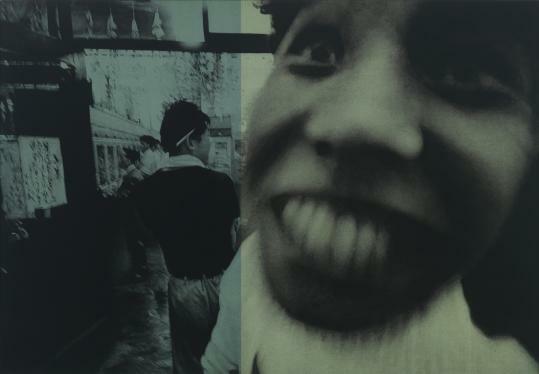 Frank Egloff’s “after William Klein, 1961 (Pachinko doorman, Tokyo)’’ (above) at Clark Gallery. To say that painter Frank Egloff works from photographs is an understatement. Egloff changes tones, fracturing and reconstructing pictures. He prods our tendency to take photographic reality as fact, asking painterly questions about surface, facture, color, and illusion. Egloff’s expansive show at Clark Gallery includes a meaty selection of his explorations of work by photographers such as John Deakin, Man Ray, and Garry Winogrand. In “after William Klein, 1961 (Pachinko doorman, Tokyo),’’ he deconstructs the fashion and travel photographer. Klein is known for using motion blur, and here the right side of the frame is filled with the fuzzy, leering grin of a man mugging for the camera. On the left, a man with his back to us dominates a sidewalk. Egloff breaks the image down the middle with a change in tone — from underwater blue to bottle green, both monochromes, and colors that distance the viewer from the bustling, agitated scene. Although Egloff usually works in monochromes, the garish, tongue-in-cheek “from Richelieu, 1989’’ has him punching up color. The source photo was a jewelry ad. Egloff’s version shows an elegant, aqua-skinned woman in an off-the-shoulder red wrap against a gray ground. She wears a choker that looks like woven strings of shells or wooden beads, a bland beige that pops against the blue skin. Viewers often wonder if Egloff has used a transfer process to get these images on canvas (he doesn’t) — his re-creations are precise down to skin texture. But his most recent work is completely different, a line drawing made with a pigment marker. “Pollock’s car, 10:15 p.m., Saturday, August 11, 1956, Fireplace Road, the Springs, East Hampton, NY,’’ borrows from a photograph of the scene after Jackson Pollock died crashing his Oldsmobile convertible. It distills the image of the overturned car beneath a tree in spare black and white. The crazy, splattering lines of the leaves above and the grass beneath the car hauntingly echo Pollock’s paintings, but bled of color and texture. Egloff is still square in the middle of the intersection of photography and painting with this piece, but it’s a radical turn in a new, intriguing direction. Ursula von Rydingsvard’s small show at Barbara Krakow Gallery delivers the sculptor’s aggressively hand-hewn style in one sculpture and several works on paper. The sculpture, “Exploding Bowl,’’ lives up to its name. It approaches 3 feet high and 5 feet across, and it’s made from stacked cedar beams that the artist cuts, gouges, splinters, and scribbles over. It has a vortex-like structure, a suggestion of violence and power with a deep, narrow bottom, and its rims ripple voluptuously. If Paul Bunyan made a flower out of lumber, it would look like this. Textures and lines, the evidence of making, are all over von Rydingsvard’s untitled paper pieces as well. One piece made with thread, pigment, and linen on handmade paper starts with the crinkles and undulations of the paper itself, accentuated with breaths of gray. Quiet at the top and angry at the bottom, the piece’s lower quadrant is a fierce, bubbling passage dotted with hairy circles and tangled with a fringe of black thread. It’s fierce, yet fragile — a tension this artist specializes in. Todd McKie’s work is so funny and light — although tinged with an edge of panic and pathos — that it’s easy to think he dashed it off. In fact, he works painstakingly. Look at two shows he has up at Gallery NAGA. In one, a collaboration with photographer David Caras, he has applied simple facial features to the backs of the heads of bald men. “Mike,’’ on the head of a broad-necked man, has eyes shut and a long nose but no drawn mouth, because a crease at the bottom of the man’s head serves that purpose. A funny doodle? No. McKie, working on acetate laid over Caras’s photographs, might have made 20 or 40 or 200 tries before he drew a face he felt fit. Comic as they are, these are poignant characters, vulnerable and exposed. So are the figures in McKie’s painting exhibit. In “Ouch,’’ a serpent rises up and bites the prominent nose of a fellow with an oval head, an oval body, and spindly legs. He stands before the simple line drawing of a chair. McKie’s ground has become more mottled in recent years, changing up his flat, cartoon style into something spacious, creating a lush tension with his childlike portrayal of figures. Here, bright greens and blues emerge from gray like the sky peeking through clouds. “Pity Party (I’ll Bring the Snacks)’’ features a poor soul with a blue-green head shaped like a sideways U, his nose snaking down into the opening. Just that conveys much about his mental state. His body is an ocher lump. He has a half-empty glass, a plate with a fish skeleton, and a hunk of cheese. If we laugh, it’s because we relate.